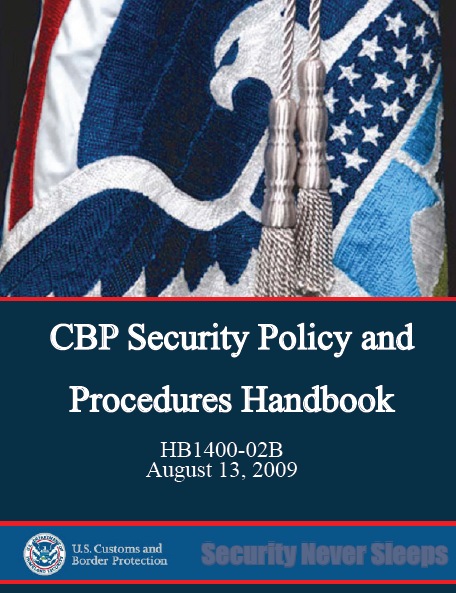 The following is the complete U.S. Customs and Border Protection Security Policy and Procedures handbook from August 2009. An incomplete version of the document was previously released by Cryptome in 2010 that contained only “minimum security requirements” for architects and engineers. This version is more than 600 pages longer and contains information on everything from document control to the use of the Homeland Security Advisory System. The handbook was obtained from a publicly-accessible website associated with a prominent construction company. 1.1.1. U.S. Customs and Border Protection (CBP) Internal Affairs, Security Management Division is responsible for providing operating policies, procedures, and practices for the physical protection of personnel, infrastructures, and assets from deliberate or unforeseen threats. 1.1.2. These standards shall be applied to all CBP facilities, owned, leased or occupied space. Compliance is mandatory for all new construction, renovation, and relocation projects. Existing CBP facilities are not required to be upgraded unless risk assessment determines otherwise. 1.1.3. These standards shall be used by the Office of Internal Affairs, Security Management Division (SMD) to serve as a guide for: Conducting security surveys for the development of threat assessments; evaluating security conditions during real estate market surveys and using the requirements guide for architectural and engineering (A&E) design efforts. Nothing in this policy handbook shall be construed as contrary to the provisions of any statute or other Federal regulation. In the event of conflict, specific statutory provisions shall apply. 1.1.4. Physical Security Programs shall be administered within each Region, District, and field activity based on the policy set forth in this handbook to ensure the protection of CBP assets. These programs shall be continually and effectively administered and monitored to ensure their integrity. At a minimum, a Physical Security Program shall include those items outlined in Chapter 2.1: Policy. 1. A hold room is a secure facility for the detention of aliens encountered and processed by operational components of CBP. 2. The hold room is used for detainees and is located within the access-controlled secure and violator processing area. All access control equipment will be HSPD-12/FIPS 201 compliant systems and will only be installed by approved GSA Schedule 70 vendors. 3. Hold rooms for detainees must be constructed to hardened construction standards and must be situated in a secure area to ensure the safety of both officers and the traveling public. Hold rooms should be co-located and rectangular in shape with no dividing walls or partitions. All fixtures must meet detention-grade standards. (d) A single occupant hold room for detainees is therefore a minimum of 37 Sq. ft. Multiple occupancy rooms shall be 37 Sq. ft for the first occupant and 7 sq. ft of unencumbered space for each additional occupant. (a) Interview Rooms must be located adjacent to the hold rooms, and either within or outside a secure perimeter zone. They must be under 24X7 surveillance and detainees are required to be secured with handcuffs. If located within the violator processing area, the interview room must have the same construction criteria as the hold room. Asylum seekers must be placed in a separate interview room. (b) Search Rooms must be located adjacent to hold rooms within a secure perimeter zone. It has the same specifications as a hold room, except there are no windows, toilets and floor drains. (c) Alien Property Storage Rooms must be located within a security perimeter, securely constructed for high attack resistance and they require a door lock and an Intrusion Detection System. 2. According to the Service Processing Center Detention Construction Standards (SPC Detention Construction Standards, Dated 01 November 2004), hold rooms are classified as having a Medium Security Level. 1. Concrete masonry unit walls shall be a minimum nominal 8” (200 mm) wide units reinforced with #4 (No. 13 metric) vertical reinforcing bar at 16” (400 mm) on center. All cells of concrete masonry units shall be fully grouted with 3,000 psi (21 Mpa) grout. 2. Pre-cast concrete panel walls shall be a minimum nominal 4” (100 mm) wide, minimum strength of 5,000 psi (35 Mpa) and reinforced with minimum W4 (MW26) welded wire fabric at 4” (100 mm) on center in both directions, conforming to ASTM A185. 3. Cast-in-place concrete walls shall be a minimum 6” (150 mm) wide, minimum strength of 3,000 psi (21 Mpa) reinforced with #4 (No. 13 metric) reinforcing bars at 8” (200 mm) on center in one direction. Cast-in-place concrete walls that are less than 6” (150 mm) wide, but no less than 4” (100 mm) wide shall have a minimum strength of 5,000 psi (35 Mpa) reinforced with W4 (MW26) welded wire fabric at 4” (100 mm) on center in both directions. 4. Steel wall panels shall be 0.093 in. (12-gauge) minimum thickness A-60 galvanneal steel conforming to ASTM A 653-CS requirements. All structural or stiffening members shall be 0.058 in. (16-gauge) minimum thickness A-60 galvanneal steel conforming to ASTM A 653-LFQ requirements. All structural tubing stall be 0.115 in. (11-gauge) minimum thickness steel conforming to ASTM A 653-CS and ASTM A-525, G-90 galvanized requirements.